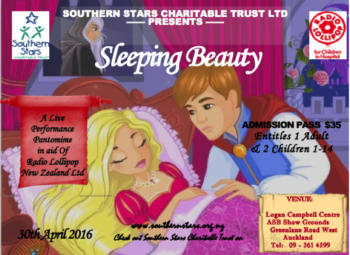 Southern Stars in support of Radio Lollipop proudly presents the classic pantomime ‘Sleeping Beauty’. This is your chance to grab the kids and watch this fantastic story come alive on stage at Auckland’s Logan Campbell Centre, April 30. Its a story of love, loss, poison apples, kings, queens and a handsome prince who saves the day! Tickets are limited and can be purchased for personal use or donated to under privilege children within the wider Auckland area. Volunteers may call you at home or you could simply head online to the Southern Stars website to purchase directly. This is your chance to enjoy one of the best children’s stories live on stage.